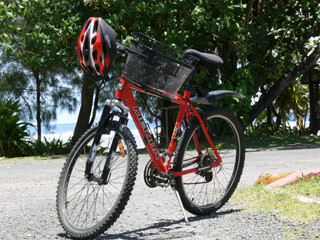 If you want to explore Rarotonga by push bike, we have bicycles for hire to suit your needs. Whether you want to bike in comfort on the main road or explore more of our beautiful Rarotonga inland, our range of quality rental mountain bikes and comfort bicycles will satisfy you. We have different bicycle brands for hire, including Apollo, Merida, Avanti, Raleigh and Radius. Our mountain bikes have either 21 or 28 gears and our comfort bicycles have either 6 or 7 gears. We have different sizes of adult bike frames as well as 24″ kids bicycles. We also hire Polisport toddler and child bike seats, both front and rear mount. All our bicycles have fork suspension and most bikes have bottle holders. We also rent bike helmets for your safety and hire other bicycle extras like shopping baskets, gel seats and MTB mudguards, should you require any of them. Bicycle theft is not an issue on Rarotonga, however we still provide bicycle locks for all our rental bikes.